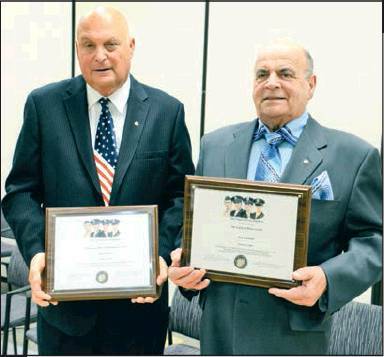 Livingston’s veterans’organizations honored community volunteers Don Schwartz and Nick Santinelli at their Four Chaplains Legion of Honor Award ceremony on Sunday, February 3, at the Livingston Community/Senior Center. The award, which recognizes acts of volunteerism, brotherhood, and sacrifice, is named for the four chaplains of the USAT Dorchester. The ship was torpedoed during World War II, and as it sank, its four chaplains gave up their life jackets to other crew members, sacrificing their own lives to save others. 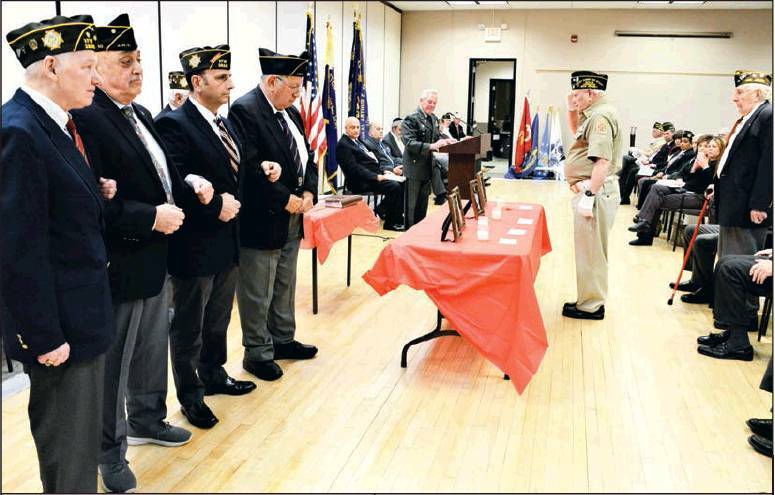 Shown above, representatives of Livingston’s veterans’ groups (the Veterans of Foreign Wars Post 2856, the American Legion Post 201, and the Jewish War Veterans Post 740) lock arms in solidarity as four candles are extinguished in honor of the four chaplains. At right, Four Chaplains Legion of Honor Award recipients Schwartz and Santinelli display their awards and lapel pins. 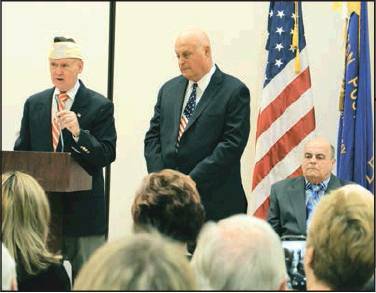 Below, Veterans of Foreign Wars (VFW) Post 2856 Senior Vice Commander Brian Boyle describes the four decades of volunteer photographic services given to date by photographer Schwartz as fellow honoree Santinelli, far right, listens.